If you have not received certain emails you are expecting or are missing any new messages in Outlook altogether, troubleshooting could help you pinpoint and resolve the issue. Look for these common causes for Outlook not receiving emails to make sure you don’t miss another message. **These instructions apply to Outlook 2019, 2016, 2013 or 2010; Outlook for Mac 2016 or Outlook for Mac 2011; and Outlook Online. It is possible that emails are in your Junk folder. In addition, you might have inadvertently downloaded them on another device, such as your phone or your work computer. If your Outlook profile is corrupt, it can cause you to stop receiving emails. Creating a new profile and setting it up with your email account can solve the problem. If your email service requires authentication and your settings are not correct, you will not receive emails. Go to the Tools menu and click Accounts. Select the email account in the left pane of the Accounts box. Click More Options under Outgoing Server. 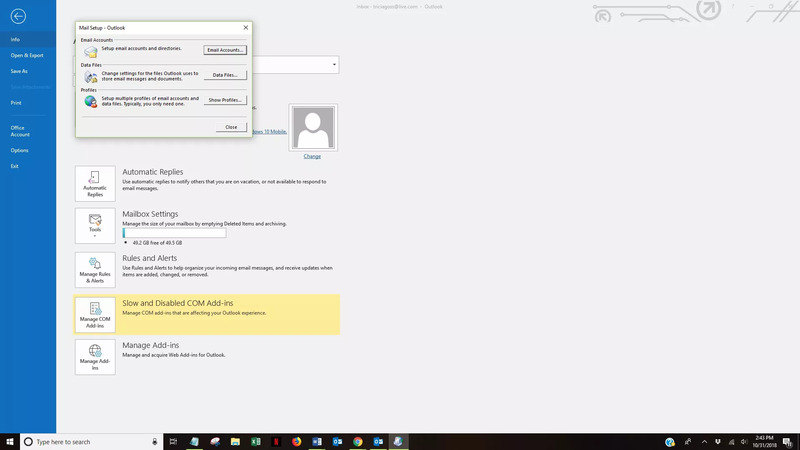 Choose the authentication type on the pop-up menu that appears. Follow the prompts to enter your credentials. Before you begin troubleshooting, make sure you are connected to the internet. If you do not have a good connection, you will not receive new email messages. Outlook.com divides email messages into two tabs: Focused and Other. Some of the emails you are expecting could have been filtered to the Other tab. Click on the tab to see if any messages appear. If you have created any rules, it is possible that your emails are being routed away from your inbox or even deleted. Click Mail in the left pane. Choose Rules in the right pane. Find any rules that are preventing you from receiving or viewing emails. Select a rule you want to change and click Edit. Change the actions of the rule and click Save. Delete a rule by selecting the rule and clicking Delete. Click Inbox and Sweep Rules on the left side of the screen. Similarly, you might have set up email forwarding and forgotten or expected it to expire. You can check these settings and turn them off, if necessary. Choose Forwarding in the right pane. Select Stop Forwarding and click Save. Select Forwarding in the left pane. **If you have previously forwarded another account to your Outlook.com email but are no longer receiving those emails, check to see whether the forwarding has expired or is not properly set up.